LEGIT TimeBucks Reviews: SCAM or LEGIT? TimeBucks is another GPT (get paid to) website that is based in Ras al Khaimah, United Arab Emirates. The site is an international site and allows anyone to join. What I find different about this site compared to other GPT sites is the way they have organized, the site and make it so easy to find the offers on the site. Plus, on this site, they have so many unique offers for you to complete in order to earn money. If you wanted to work on this site or promote the site, you could actually earn a nice passive income weekly from this site. Joining: It is super simple and easy to join. You don’t even need to verify your account. Just sign up with your email or even your Facebook account. One Time Offers: When you first join start completing the one time offers to earn quickly. Watch Videos: This is a great offer wall that has a lot of videos for you to watch. You should check this daily. Install Free Apps: Like all GPT sites, there are a lot of free apps that you can download and install. Just make sure you read the instructions before doing this one. If you don’t, you could miss out on your pay. Instagram: Earn points for following people on Instagram. Complete Surveys: You’ll need to check this daily for new surveys. Like all surveys, you understand that your location really matters and that Tier 1 countries have more surveys than Tier 3 countries. VotePolls: This one is kind of fun. You can earn money for voting on the different polls that the site has. Referral Program: This site has a fantastic referral program. The program is 5 layers deep and you have a great chance to earn extra money from inviting people to the site. Take Photos & Grow a Beard: This one really made me laugh. Normally the photos you take are selfies. Yes, believe it or not, you can grow a beard and take photos of the progress and earn money for this. I’ve never seen this before on a GPT site. Offers: Like all GPT sites there are plenty of different offer walls to earn from. Just keep in mind if you need to use your credit card, it is necessary to cancel your subscription before it expires. Otherwise, you’ll be paying for this offer. Mining Cryptocurrencies: You can install a tab on your browser to earn coins or rewards for mining cryptocurrency. Earn Money Tab: Each day if you complete 10 tasks on the site, you can go to this tab and receive 1 free roll. The tab will donate the money to your account. This is free money so why not go there and hit the roll key and see what you earn. Each week the company processes the payments on the site. You’ll need $10 in your account to be paid. They will pay you through PayPal or even Payza. Has anyone ever joined this site before? Thanks for posting this in the forum. I am the support from Timebucks. I noticed that no one has replied to your post, so Ill do it. If you need any help, just send us a message. TimeBucks is a GPT/Survey site that has unique features and quite alot of ways to earn money from it. I have earned a total amount 350$,they pay every thursday.My last payment was 2 August as I wasn't really active on it this last weeks. I also really recommends you to get referrals sharing it with your friends or sharing it on forums as it's a good way to earn. Wow! Great earning mate. Looking very promising GPT site. I will surely join under you if you guide me to earn money from this website. Congratulations on your earning! May I know how long it took you to earn that amount? Congratulations on earning this great amount. How much time it took you to earn this amount? I would love to join under you but you need to share some more insights with us. i agree. We all aim to earn. Right? 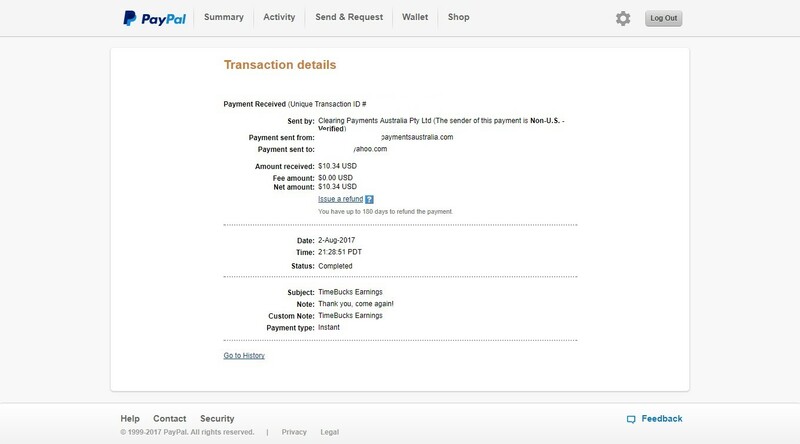 Thank you for sharing on this forum this new online earning opportunity ,posting payment proofs.By the way,nice earnings you got from this Gpt site.How much time you needed to make this sum? Maybe I will try it out too. Congrats on your payout from timebucks! I actually have timebucks as well but I never reached the threshold. How many days were you able to accumulate $10 in timebucks though and what were the things you did inorder to earn fast there? Thanks! Wow that was a good amount of money, Congratulations friend. If you want to write a review about this site you can post your review here. That's nice to know. Can you share the ways through which we can earn money on time bucks. Also share how much is the minimum to withdraw payments and what about the referral system, how much they pay for each successful referral? This is definitely a considerable amount to earn on this site, and you earned it mostly from referrals or surveys? How long did it took you to earn this amount of money (350$) ? I tried to sign up via your link but it says I can sign up for 1 account and if its an error contact them and I never sign up before so I contact them and waiting for their reply , let's see! thanks for sharing! maye, it's take from him less than week because this company paied every week.